Bruce L. Smith retired from the U.S. 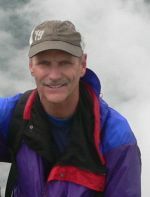 Fish and Wildlife Service in 2004 after a thirty-year career as a wildlife manager and scientist. He was named Wyoming’s Conservationist of the Year in 1997 and received the John and Frank Craighead Wildlife Conservation Award in 2005. His latest book, Life on the Rocks: A Portrait of the American Mountain Goat, won two National Outdoor Book Awards. Jeff Karnicky is an associate professor of English at Drake University. He is the author of Contemporary Fiction and the Ethics of Modern Culture.